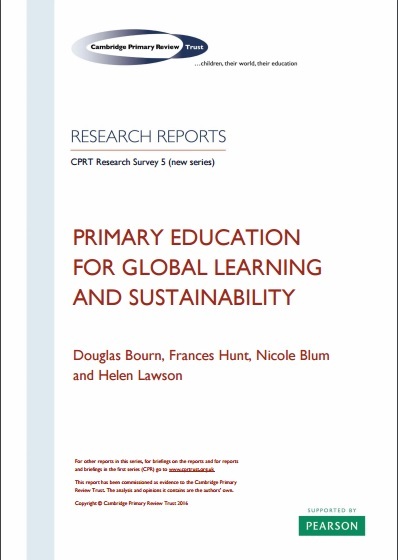 Bourn, D., Hunt, F., Blum, N., and Lawson, H. (February 2016) Primary Education for Global Learning and Sustainaiblity. 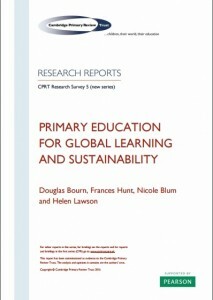 York: Cambridge Primary Review Trust. Picking up the threads from the Cambridge Primary Review’s concern that primary education should look outwards to the world in which our children are growing up, (‘Children, their World, their Education’), and from the explicit commitment of the Cambridge Primary Review Trust to sustainability, equity and community as key educational priorities, this survey will (i) outline the challenges of sustainability, equity, global understanding and citizenship, especially as these bear on young children’s education; (ii) consider the United Nations education agenda post-2015, and its implications for education policy and practice in the UK; (iii) assess recent policy initiatives and consider other policy options; (iv) review selected practical strategies for primary schools.